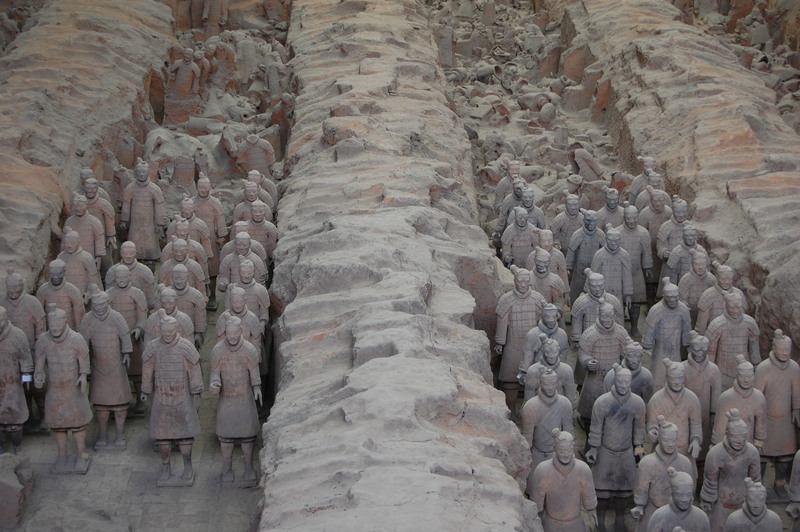 The Terracotta Army stands alongside the Great Wall and the Forbidden City as iconic symbols of China. Discovered in the 1970s near the modern day city of Xi’an in western China, the army is comprised of an estimated 8000 human figures along with horses and elaborate chariots. Despite the popular title of an army, not all the figures are of soldiers. Acrobats, musicians and court officials have been discovered in recent digs. 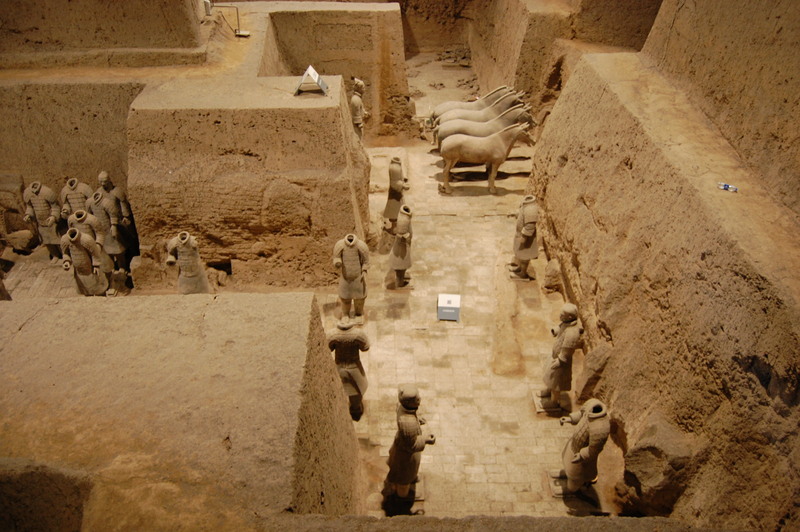 More than an army of the dead or tomb guardians, the terracotta figures represent a tangible link to the very beginnings of the Chinese nation and are a cornerstone of the cultural heritage of China. 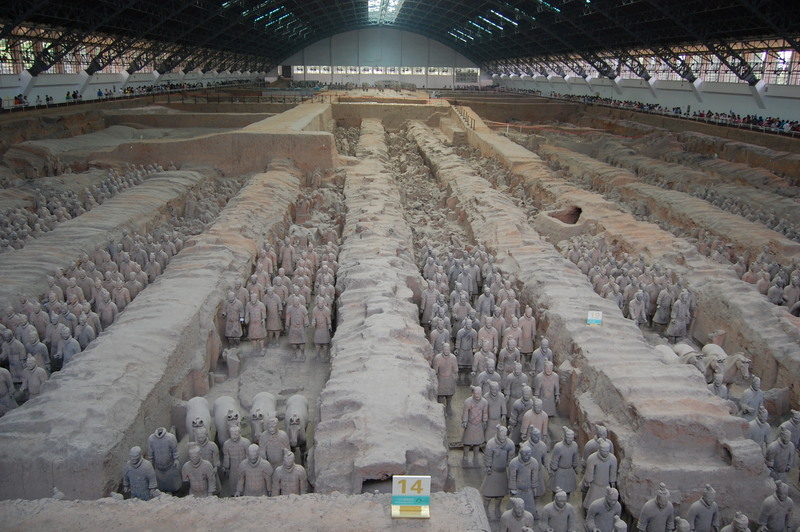 The origins of the Terracotta Warriors date to 246 BCE and the start of the reign of Qin Shi Huangdi, first Emperor of the Qin Dynasty and eventually the first emperor of a truly unified China. Born to the name Zhou Zheng during the turbulent Warring States era, young Zheng ascended to the throne of the state of Qin at the age of thirteen. The state of Qin was one of seven major powers in China created by the collapse of central authority as the Zhou Dynasty lost power to local nobles. The seven states were constantly at odds with each other, which lends the era its descriptive title. In a series of bold attacks and decisive campaigns, Zheng managed to defeat the rival states by 221 BCE and establish himself as the sole ruler of much of what is now modern day China. To commemorate his victory and the unification of China, he changed his name from Zheng to Qin Shi Huangdi, which loosely translates to “First Emperor of the Qin.” Hence part of the emperor’s name, his dynasty and that of his original state are the same. Once Emperor, the power and resources available to Qin Shi Huangdi were vastly increased. As a result, his burial complex grew both in size, cost and magnificence. Construction of the site at the Qin capital of Xianyang near modern day Xi’an had already begun upon Qin Shi Huangdi’s enthronement as king of Qin in 246 BCE, as it was customary to build a tomb for a ruler while they still lived while given the amount of time and manpower involved in such an undertaking. Various ancient records and modern historians estimate the nearly forty years of construction required the combined efforts of anywhere from 16,000 to 700,000 men. 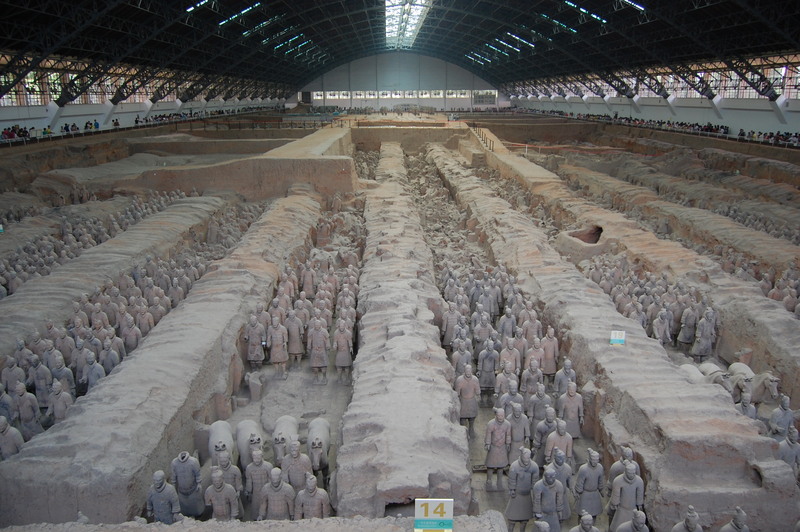 Even with the massive expenditure of money and effort over decades, the tomb was not fully completed as construction was halted two years after Qin Shi Huangdi’s death in 209 BCE due to large scale uprisings that destabilized the relatively new Qin Dynasty. The warriors of the army were placed in military formation in three large, solidly built pits to the east of the main tomb. Some historians believe the placement symbolically protects the Emperor from enemies, as Qin was the westernmost Warring Era state and thus all foes would come from the east. The warriors themselves are masterpieces of Qin era artistry, yet perhaps their most surprising aspect is their individuality despite the mass production techniques used to produce them. Each figure seems individual, sporting distinct hairstyles, facial hair and faces along with subtle variations in uniform and armor. While archeologists doubt any figure was meant as a portrait of a once living person, the artisans were likely ordered to attempt to capture the diverse nature of the Qin army, which encompassed men from all over China and from a variety of different ethnic groups. To create the nearly 8000 figures estimated to lie within the confines of the first Emperor’s tomb, artisans used terracotta, a form of clay. Clay was a plentiful, easy and cheap material for Qin artisans to work with. First, the various body parts were sculpted by skilled artists. From the original sculptures, molds were created that allowed for the fairly rapid creation of the army. The bodies, arms and legs were produced in separate large molds. The bodies which were then customized by the use of smaller molds which produced different heads, ears, shoes, hats and so on. By combining the bodies with different combinations of parts and then using terracotta to sculpt additional variations onto the warriors, the appearance of individuality was achieved. 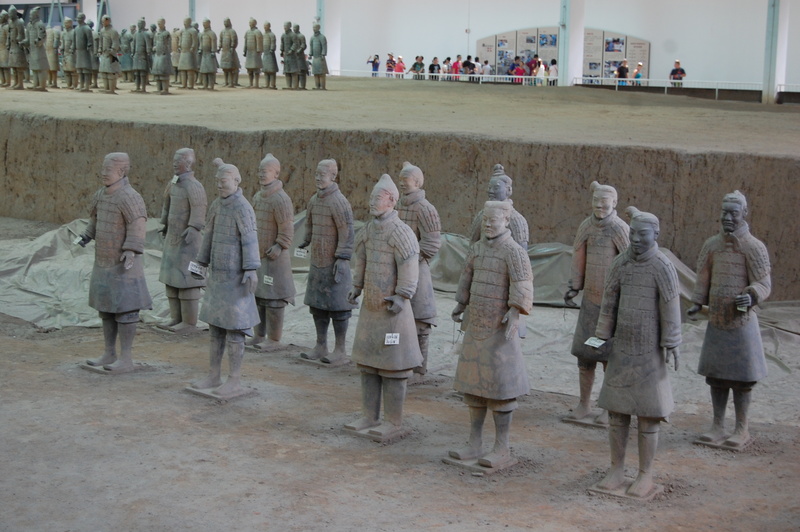 As the terracotta soldiers represent a real army, the figures are of three specific heights, with high ranking officers being the tallest and the common soldier being the shortest. Among the common soldiers can be found kneeling archers and charioteers next to their bronze chariots and terracotta horses. 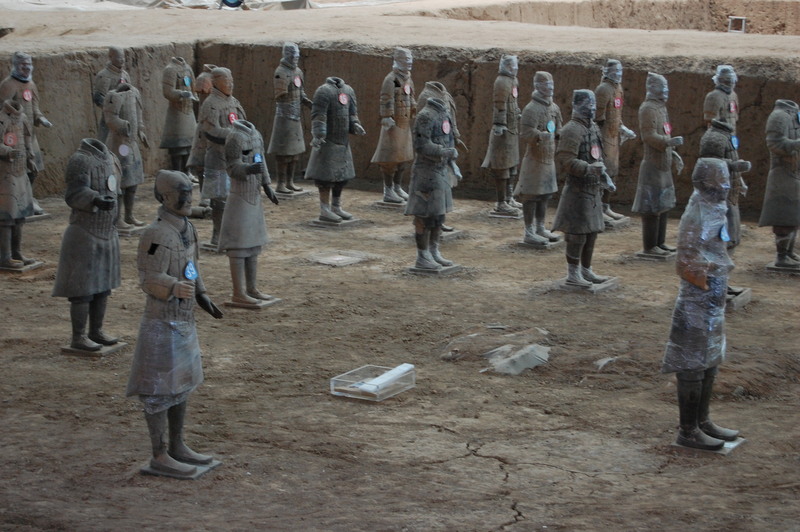 Metal weapons are found next to some, but not all of the soldiers, potentially indicating looting in the post-Qin era. 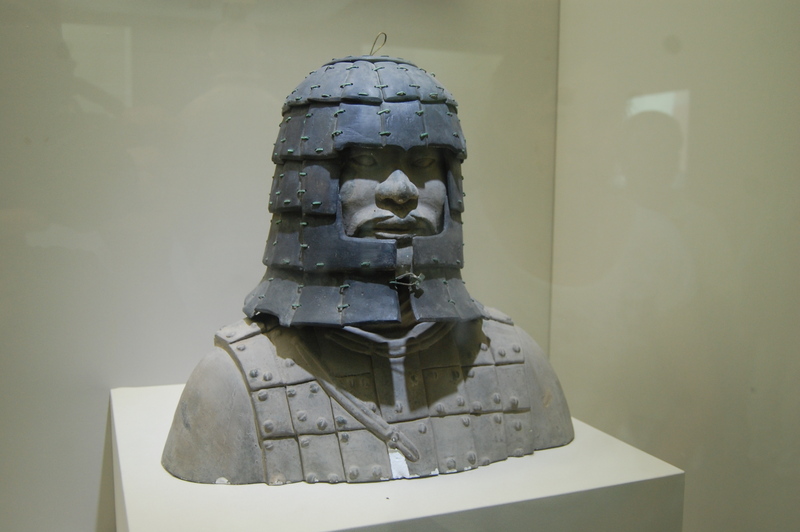 While the army has a modern reputation of a monolithic force of dark grey warriors, like Greek and Roman sculptures the Terracotta Army were originally painted to approximate the look of a living army. However, once unearthed and upon exposure to the air, the paint quickly oxidized and fell away. The bulk of the army was found entombed in three large pits. A fourth pit has been discovered empty, a mute reminder that the tomb complex was never completed as planned. 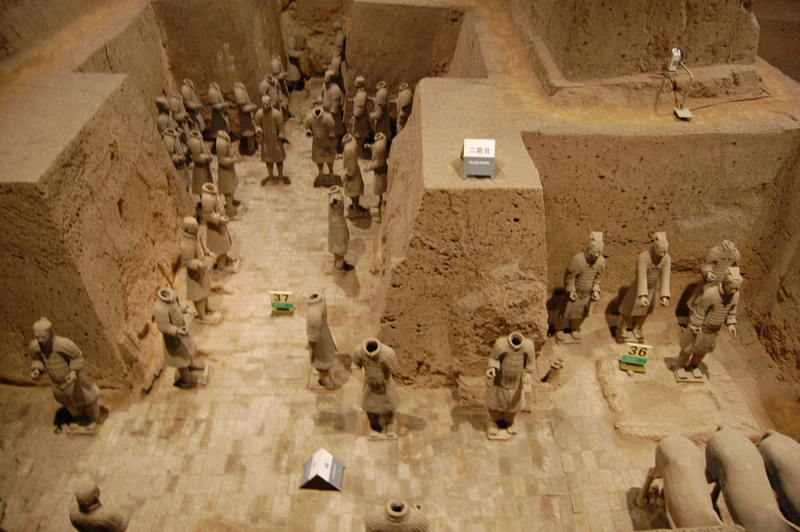 While most of the terracotta figures are generally intact, some broken sections and fire damage to the pits again points to looting amidst the chaos surrounding the end of the Qin dynasty around 206 BCE. Yet soldiers and implements of war were not the only terracotta figures found. Excavations near the first emperor’s tomb have uncovered terracotta figures of court officials, strongmen and acrobats, the latter of which have only recently been unearthed. The appearance of these figures is generally seen to be an attempt to recreate court life in the afterlife for the Emperor. 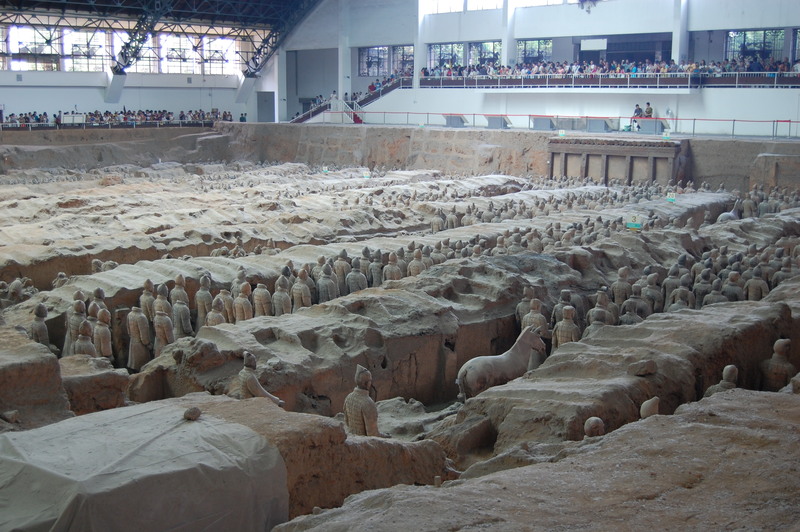 Even with the magnificence of the Terracotta Army guardians and the dazzling stories and legends of the amazing artifacts within, Qin Shi Huangdi’s tomb itself has not yet excavated, nor are there any immediate plans to do so. 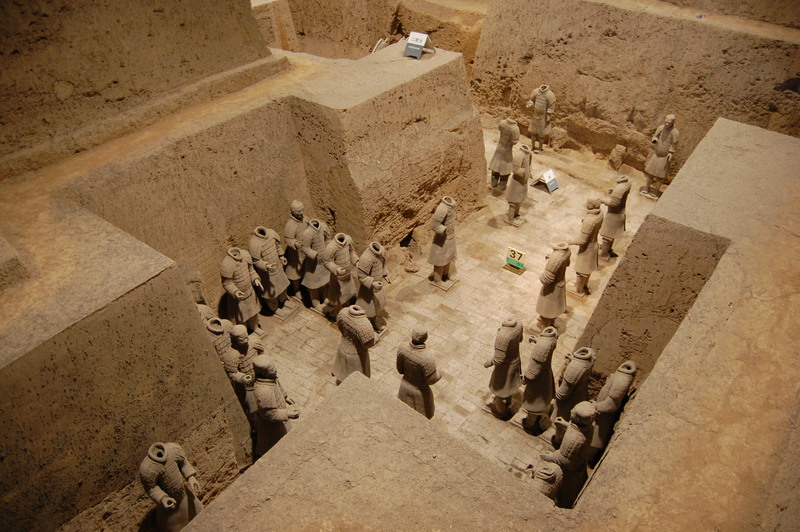 Despite the knowledge of Qin Shi Huangdi’s burial mound and accompanying complex, the existence of the warriors went unnoticed until 1974, when a group of farmers digging a well broke into the main burial pit. 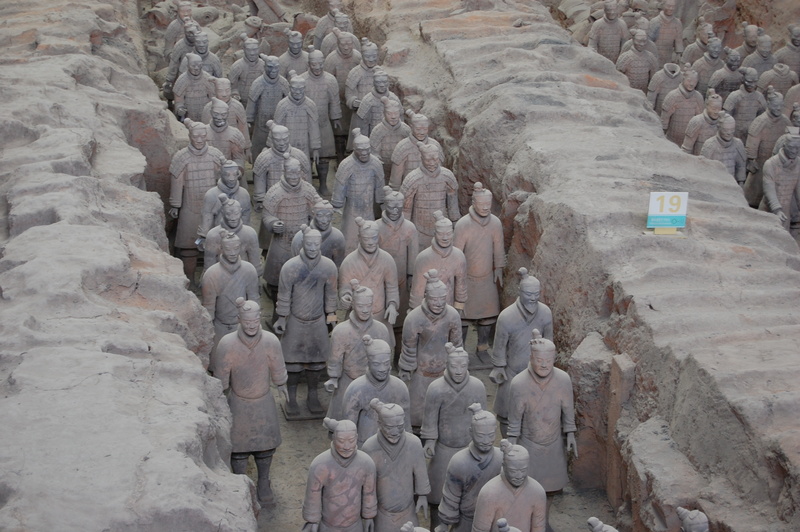 They reported the discovery to local authorities and an archaeological survey uncovered the terracotta soldiers. To this day, the farmer credited with making the discovery sits at the museum on occasion, signing copies of a book on the warriors. For all the power Qin Shi Huangdi’s amassed in his life, his dynasty did not last long past his death. After his passing in 209 BCE, inept leadership and resentment over the harsh practices employed by Qin Shi Huangdi to unify China and cement his rule resulted in an uprising that eventually toppled the Qin dynasty and led to the creation of the Han dynasty. Despite his dynasty’s brief reign, Qin Shi Huangdi contributed a great deal to the formation of the Chinese nation. His legacy remains mixed due to the harsh measures he utilized to unify China, yet his role as one of the pivotal figures of history cannot be underestimated and his Terracotta Army have become cultural ambassadors. Far removed from their original place and function, replicas stand in Chinese restaurants in America, a somewhat strange fate when considering their original roles as tomb guardians. Exhibitions featuring the warriors have drawn large crowds around the world and UPS has used their safe delivery of the warriors as a marketing point. The warriors have inspired enemies and allies in computer games such as World of Warcraft and have entered the popular imagination the world over. 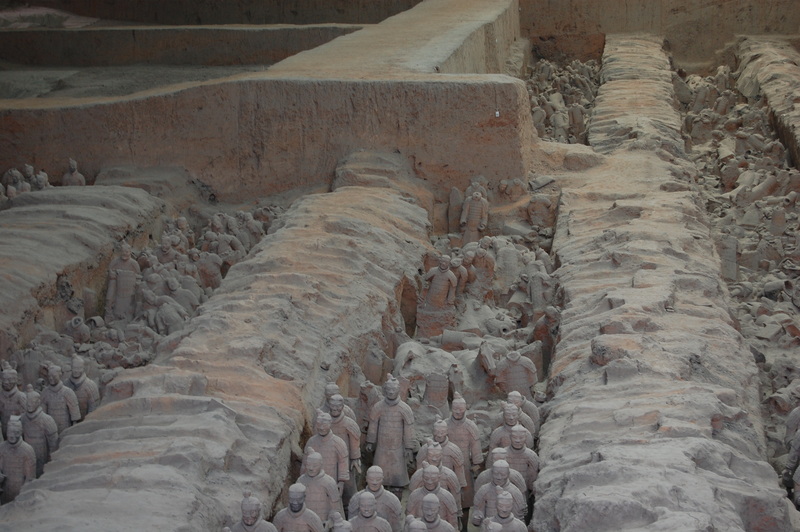 As part of the legacy of the first Emperor and of the unification of a nation, the Terracotta Army have become symbols of China itself.